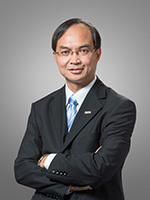 Nicholas Kwan, Director of Research of the Hong Kong Trade Development Council (HKTDC), a statutory body set up in 1966 to promote Hong Kong’s external business. Nick manages a team of about 30 economists and research professionals, providing macro-economic and business research support to the HKTDC and its various stakeholders. Nick also serves as a member of the Hong Kong Committee for Pacific Economic Cooperation, and was an Associate Member of the Central Policy Unit of the Hong Kong Government. Nick was formerly the Asia Chief Economist and Head of Research of Standard Chartered Bank. Earlier, Nick worked at the Hong Kong Monetary Authority (HKMA), specializing in macro-economic and policy research, and was the Asia Pacific Regional Chief Economist of Merrill Lynch. Nick is an economics graduate of the Chinese University of Hong Kong, with an MBA from Warwick University in the UK and was a Chartered Financial Analyst.